HITEC-MED's job is to proactively search for ways and solutions to protect your practice. It seems like every day, we read about another data breach, ransomware attack, and HIPAA fine. In fact, the Equifax breach has impacted over 140 million US consumers. With this in mind, we decided to find a program to help our clients protect their practice and their reputation. First, we've partnered with PCIHIPAA to provide you with a solution called OfficeSafe ID. The service is free of charge for an entire year. The program pays to restore your identity to the way it was before a breach. In other words, if your identity gets stolen, this program will not only fix it but will also cover all the costs. Secondly, we've arranged to help you with your mandatory 2018 HIPAA Risk Assessment before year end. It's a 42 question assessment, that should take you less than 10 minutes. We highly recommend you maintain an updated HIPAA risk assessment on file. It's now the law. PCIHIPAA will also provide a free review of your results. We have vetted their program, and many of our clients use them. And as a Holiday Offer, if you enroll in their program before January 15, 2018, they have agreed to provide two months of free compliance. 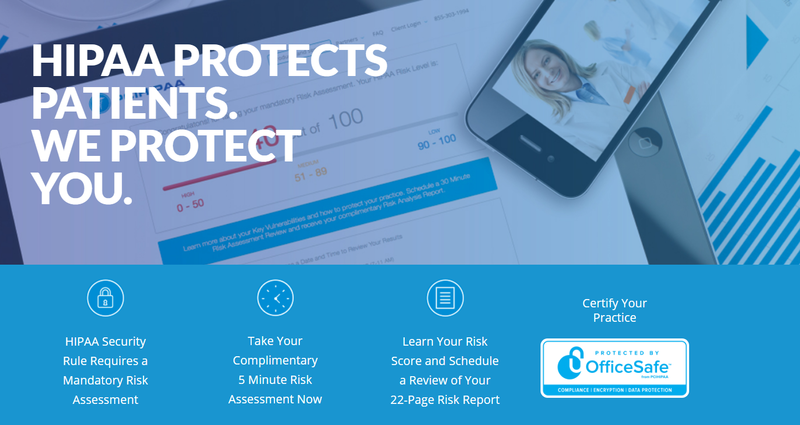 All you need to do to get started is to take the free HIPAA Risk Assessment. If you have any questions, please call (800) 588-0254.